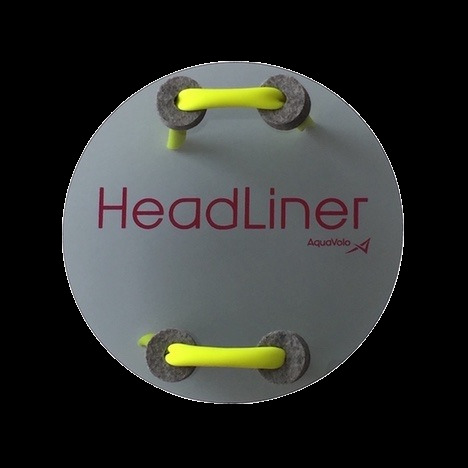 HeadLiner is a training tool that encourages the swimmer to retain a stable head position throughout the stroke and develop quick and low—almost invisible—breaths by improving the timing of inhale. Read this article for more details. You place HeadLiner against your head and start swimming. The oncoming flow of water keeps HeadLiner against the head as long as your head doesn’t wobble. HeadLiner helps improve technique and create awareness by encouraging the swimmer to retain a stable head throughout the stroke, improve timing of the inhale, and develop quick and low breaths. Head stability and breathing are two vital skills swimmers need to swim fast and efficiently. In order to increase speed and conserve energy, the head must be in line with the rest of the body throughout the entire stroke. When you breath to the side, your body rotates somewhat and generates more drag. A quick breath and stable head reduce drag and reduce energy waste. The most common breathing-related mistakes are turning the head too slowly or too late, lifting the head up, turning the head back too slowly, and pulling the head too far back out of alignment. To help swimmers learn how to keep their head stable throughout the stroke and to develop quick and low breaths by improving the timing of the inhale, we designed HeadLiner. Why not use a swim paddle? The idea for HeadLiner was inspired by a common tool among coaches to improve head stability: the simple swim paddle. In this technique, the swimmer takes a regular paddle, places against the head and starts swimming. The oncoming flow of water keeps the paddle against the head as long as your head doesn’t wobble. You might even be able to take breaths and make flip turns. The problem with this is that you would already need to know how to keep the head stable throughout the stroke, and how to take quick breaths to the side. The swimmer who still needs to develop these skills is rarely able to keep the paddle against his head for more than a couple of strokes without losing it. For novices, it’s a lesson in frustration—and not in head stability—to use a regular paddle against the head. First, the asymmetrical shape of most paddles affect breathing differently on each side when used against the head. It might be uncomfortable when you breathe to the left and not to the right, for example. This asymmetry can introduce inconsistent and possibly erratic breathing techniques. To obviate this problem, we made HeadLiner symmetrical. The symmetrical shape affects breathing the same way on both sides and helps swimmers improve the timing of inhale. Because HeadLiner is symmetrical, it increases the air pocket on each side of the head equally by slightly enhancing the bow wave during the swim. The increased air pockets make it easier to breath to the side. (As you can see in the image below, the bow wave is in front of the HeadLiner and there is an air pocket below the water.) Since the only thing that holds the HeadLiner against the head is the steady oncoming flow of water, each breath to the side must be fast and low. Any delay in the timing of inhale will disturb the oncoming flow of water and make the HeadLiner fall off. This instantaneous feedback teaches the swimmer how to improve timing of inhaling and developer fast and low breaths. Second, to make the HeadLiner less precarious, we added four felt washers and connected them to the surface with soft tubing. The felt and the tubing provide just enough friction between the Headliner and the swimmer’s cap to keep the Headliner against the head, but you must maintain a constant flow of water and a stable head to keep it in place. How do you use HeadLiner? Place the headliner on the top of the head with the word “HeadLiner” legible to you. The tubing loops will be against the head at the top and bottom, and the tubing ends will face out. When you push out the HeadLiner will be perpendicular to the surface of the water. This might be the crown of the head or closer forward depending on the swimmer. Try it a few times to find your sweet spot. Like all of our products, we expect you will experiment and discover uses we never imagined. When do you use HeadLiner? Headliner is best in during warmup, cooldown, drills, and short sprints. The goal is to develop awareness so you only need to use it for a few 25s at a time every time you swim.